Have you ever wished you could go back in time or travel into the future? Maybe to change a decision that you have made or see what the future holds? You did it! You faced every challenge that life through at you and never gave up! You took the good times with the bad times and made the most out of every day. You made memories with those who mattered most. You have come so far... you accomplished what you set out to do in life. You have a beautiful family - a loving husband and two wonderful, smart, bright, respectful children. 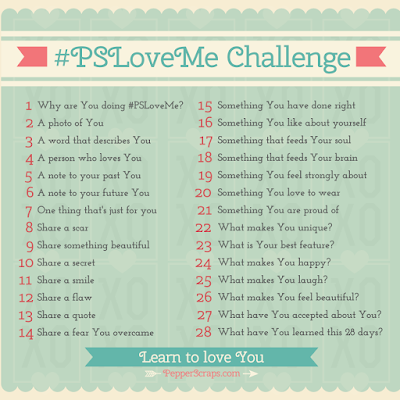 #PSLoveMe is a challenge to learn to love you. Everyday there will be a prompt for you to look at yourself, embrace who you are, and hopefully help you learn that you are beautiful, you are amazing, and you need to love who you are! I would tell my future self that I was proud that I never gave up and that I always stood up for what I thought was right.